Some of the founding members of University of Lynchburg’s club men’s basketball team are reuniting in a quest for a $1 million prize in a nationwide tournament. Led by Joe Sancio ’10, the team has registered and started building fans for The Basketball Tournament (TBT)—a competition now in its second year. LC alumni, students, faculty, and staff can help the team score a spot in the contest by becoming fans on the team’s TBT web page. The LC alumni team has one of the largest TBT fan bases in the country—sitting in second place in the country with just over 600 fans. But Sancio hopes to recruit a total of 1,000 fans by June 1 to ensure that the team stays near the top. If the team fights its way to the championship game and walks away with the prize, the players plan to donate $50,000 to LC and $50,000 to the National Parkinson Foundation, Sancio said. “This tournament is more about University of Lynchburg and helping everyone in the community than it is about winning,” said Sancio. The LC Club Basketball team began with a love for the game. During his sophomore year at LC, Sancio tried to set the sport aside and focus on academics, but that decision didn’t last for long. “During my junior year, I realized I really missed basketball and I wanted to play again,” he said. Discovering that several of his friends also wanted to play ball, but didn’t want the structure of a college varsity program, he organized a club team. Sancio followed TBT when a friend of his played in it last year. When he learned that the tournament would return for a 2015 run, he sent a text message to other players on the original LC club team. Were they interested? Sancio also recruited Courtney Brewer ’15, a current LC senior who played for the Winston-Salem Lady Warcats, a semi-professional basketball team in North Carolina, when she took a break from college. Since returning to finish her degree, Brewer has been the assistant coach for the E.C. Glass High School varsity girls basketball team. She looks forward to playing her favorite sport in the challenge of TBT. 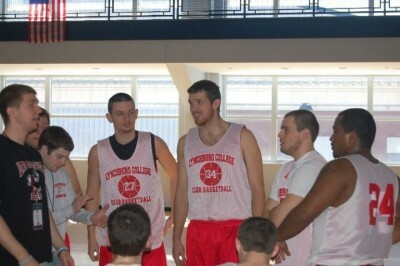 In the tournament, the LC alumni team would compete against alumni teams from much larger colleges, as well as other competitive teams from around the country. But Brewer hopes they can provide some serious competition. “We’re just trying to go in and be the underdog—the sleeper team that no one sees coming—and hopefully make our school and our families proud,” she said. To become a fan of the team, visit www.thetournament.com/teams/lynchburg-college-club-basketball and click the orange “Become a Fan & Vote for this Team” button. Voting requires registration. Each user can vote only once. On June 1, the 18 teams with the most fans in each TBT region will be granted an automatic spot in the tournament. On June 22, the top eight teams in each region will be granted a bye for the first round of the tournament. The LC Alumni team will compete in the Northeast Region because it was organized by Sancio, who works for an asset management firm in New York. The regional tournament will be played on July 17, 18, and 19 in Philadelphia. The $1 million championship game is scheduled for August 2 in New York and will be broadcast on ESPN.